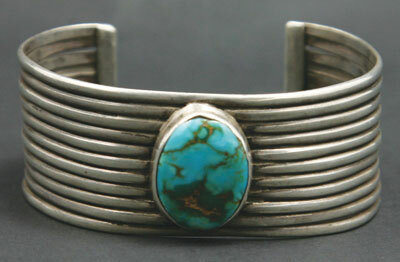 No traveler in the Southwest can ignore the abundance of gorgeous silver and turquoise jewelry available at every turn. It has become such an established part of our regional experience that many visitors are surprised to learn it is not an ancient, indigenous craft. The Spanish introduced silversmithing to the Navajo and then the Pueblo tribes just over 150 years ago. The truly remarkable aspect of Native American jewelry, however, is the speed and dexterity with which Native artisans adapted many different cultural and technical influences to create an artistic tradition truly their own. Native tribes of the American Southwest had no history of working metal before the arrival of Europeans. They fashioned their most prized personal adornments from stone – especially turquoise – and seashells, both of which were acquired through intertribal trade. When the Spanish introduced silver ornaments, (as well as copper, brass, bronze and iron) these exotic items became highly prized in Native communities. Despite the trade in metal wares, metal smithing did not cross the cultural divide until the mid-nineteenth century, more than 250 years after the arrival of Spanish settlers. Navajos were the first to take up metalwork, learning the craft of blacksmithing from Hispanic smiths in the villages of northwestern New Mexico, perhaps as early as the 1840s. By the late 1860s, several of these craftsmen had applied their blacksmithing tools and skills to the production of silver jewelry. This curious fact – that Native silverwork arose not from Spanish silversmithing but from working iron – would shape Indian jewelry design and technology for decades to come. 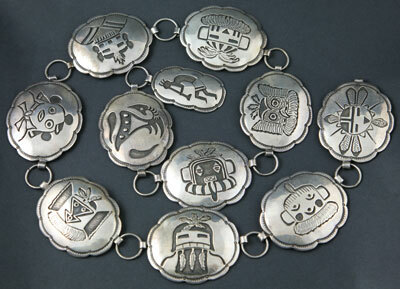 Silver craft spread quickly among the Navajo and Pueblo tribes. One of the first generation Navajo smiths, Atsidi Chon (Ugly Smith) went to Zuni Pueblo in 1872 to make and sell silver ornaments and while there, he taught a Zuni blacksmith named Lanyade how to work the white metal. Lanyade, in turn, went to Hopi in the 1880s where he taught the craft to a First Mesa resident named Sikyatala. A few men at Acoma and Laguna had taken up silversmithing by the late 1870s, and in 1879 two of the Laguna smiths had relocated to Isleta Pueblo, initiating the craft among the Rio Grande Pueblos. Silver jewelry-making thrived for a time at Acoma, Laguna, Isleta, and Hopi. By the early 20th century, however, the predominance of Navajo and Zuni smiths had made the craft economically or culturally unattractive to the other Puebloans. As the largest tribe in the region, Navajos dominated jewelry making although a larger proportion of the Zuni population practiced the craft. Together the two tribes created the Indian jewelry legacy of the first half of the 20th century. Even by blacksmithing standards, the tools of the earliest native silversmiths were primitive. Smiths crafted most of their own tools from discarded scraps of iron and steel, and traded for commercially produced hammers, shears and files when they had the means. The silversmithing process started by melting silver coins or other items in a pottery crucible or cupped piece of old iron placed on a charcoal forge made of mud. The smith puddled the molten silver into a simple mold to form an ingot or “slug.” On an anvil consisting of a dense tree stump, hard stone, or piece of iron, he pounded the ingot into a thin silver sheet. Then using chisels or shears, he cut the desired shape from the sheet and hammered it to its final form. The smith then polished the silver with fine sand or ashes before a final buffing with buckskin. An alternate method of forming the silver was to cast it in a flat mold carved into fine-grained sandstone or ash-rock (tuff or tufa) or even a piece of dense wood. Now incorrectly called “sandcasting,” this technique was less frequently used because carving and heating the mold and pouring the silver required different skills and the molds produced only one or two casts before they became too degraded to reuse. The earliest Navajo jewelry was decorated by chiseling or filing grooves on its face and edges. “Rocker work,” made by “walking” a flat-tipped edge tool on the silver, created a zig-zag engraved line. Punches, which left an O-shaped impression, and stamps fashioned from a piece of textured steel (often the tip of a file) also enabled the early silversmiths to emboss decorative patterns on their jewelry. Given the primitive technology, the earliest Native silversmiths inevitably produced jewelry that also was simple and crude. The most common early ornaments were narrow finger rings, bangle bracelets, and large buttons, all of which the Navajo and Pueblos enjoyed wearing in great abundance. The first generation of smiths also made simple ear drops and hoop earrings, and probably made that icon of Indian jewelry, the concho belt. Over the course of the 1880s and 1890s, the quality of Indian silverwork progressed rapidly. With the basics under their belts, the early smiths began to seek the advice of Hispanic silversmiths or plateros to learn the finer points of the craft. This extra instruction, combined with additional years of experience, also made first generation smiths better teachers to their sons. Most importantly, perhaps, the rise of the trading post system brought more and better jeweler’s tools and supplies to the Reservation. During this time Native silversmiths mastered additional construction and decoration techniques, such as making wire and shaping silver by pounding it into dies, greatly enhancing the variety of their jewelry designs. The most important technical accomplishment, however, was soldering. The ability to join various parts together, rather than making the ornament from a single piece of silver, allowed the construction of more complex and sophisticated jewelry. Even more fortuitously, soldering allowed the early smiths to set stones in silver. This probably was first accomplished in the late 1870s and marked the true beginning of the Southwestern Indian jewelry tradition as we know it today. 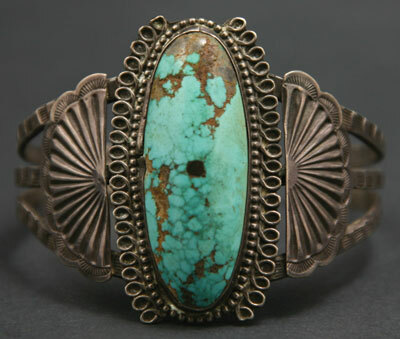 By the 1890s, turquoise settings had become nearly ubiquitous in both Navajo and Zuni jewelry. Their work was very similar, and in many cases, it is impossible to identify an item’s tribe of origin. 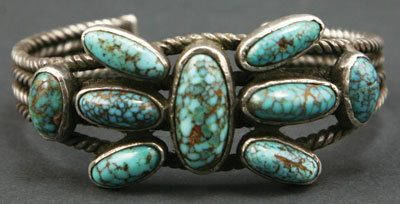 Over the next two decades, however, the two groups evolved different approaches to design with silver and turquoise. 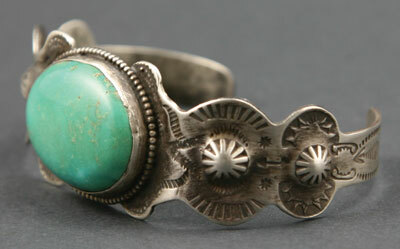 The Navajo smiths tended to emphasize the silver, valuing its weight, sheen, and ornamentation. 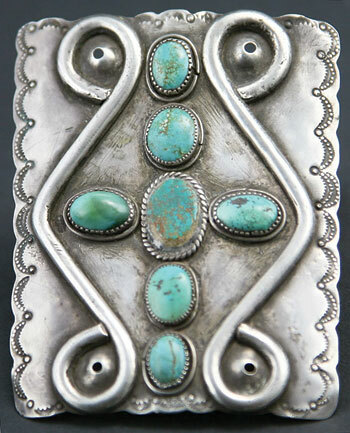 They saw turquoise primarily as another method of ornamenting the silver. The Zuni smiths became increasingly interested in designing for the stones. They tended to use more stones than the Navajo and arranged them in a larger variety of patterns. The silver was not used as the primary design elements, but merely as the vehicle for the turquoise. 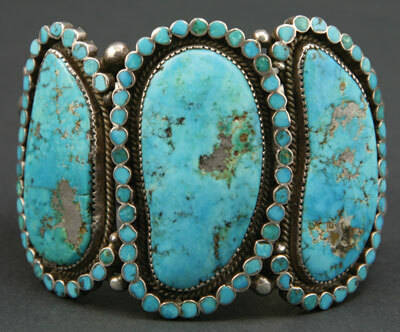 The Zuni also valued stones that were precisely cut and carefully matched in color and shape. As the early smiths shaped their stones primarily by rubbing them on pieces of sandstone, this extensive turquoise work was exceedingly tedious. 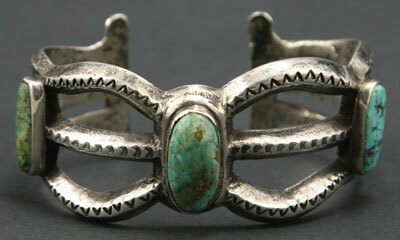 Nevertheless, Zuni silversmiths – some of them women – became highly skilled lapidaries. By 1900, Navajo and Pueblo silversmiths were making all of the jewelry forms now considered Southwestern classics. Because silver was not an indigenous craft, however, the origin of these forms reveals a remarkable mixing of cultures filtered through Native vision and inventiveness. 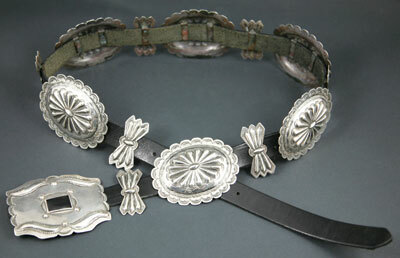 The concho belt is a perfect example. From the Spanish concha or shell, the domed silver conchos may have been derived from Spanish buckles or from the German- silver “hair plates” that Anglos traded to the Plains Indians. Certainly the idea of stringing the conchos on a strip of leather came from the hair plates (although Plains Indians wore them hanging from the back of the head rather than around the waist), but their decoration closely followed that found on fancy iron lock escutcheons made by Spanish blacksmiths. The crescent-shaped pendant called naja (NAH-zha) is an ancient symbol, used for centuries around the Mediterranean and across Europe. In the 19th century, it was commonly used by both Plains Indians and the Spanish as a bridle ornament that hung on the horse’s forehead. 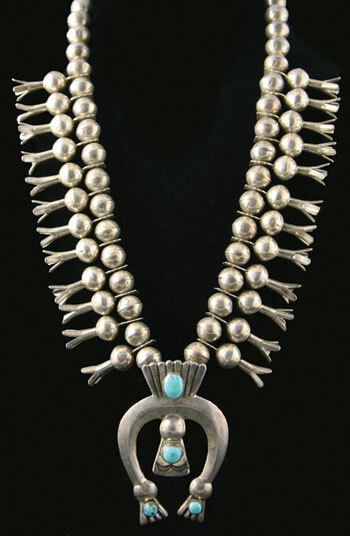 The Navajo, who made silver-mounted bridles by the 1880s, also used it in this manner, but by 1900, it was most commonly associated with the squash blossom necklace. The squash blossom, too, was borrowed from Spanish silver ornament, although Europeans knew it as a pomegranate flower. Pomegranate trees are not native to America, so the squash flower was probably the closest correlate in Native experience and, as a critical food crop, its blossom certainly was worthy of being wrought in silver. 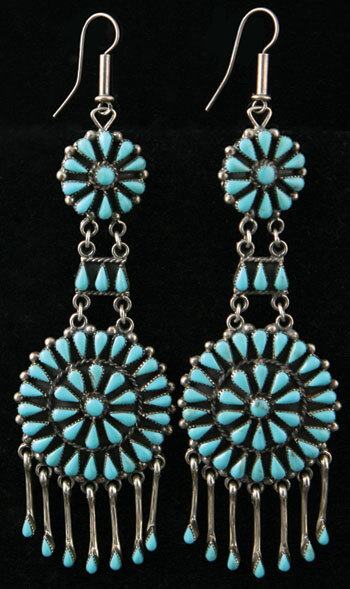 Zuni smiths eventually applied turquoise to squash blossom necklaces and the Navajo then followed suit. In the late 19th century, Pueblo silversmiths made necklaces with small crosses rather than blossoms interspersed among the beads. Equal-arm crosses were a common motif among Southwestern tribes and usually signified the four directions, but the early Pueblo necklaces typically featured Christian-style crosses and sometimes included the Catholic “sacred heart” motif at the bottom. Buttons of silver, copper and brass were very popular trade items from the early days of Spanish settlement, used by the Indians more for ornament than for fastening clothes. Native silversmiths made buttons by hammering a disc of silver into a rounded depression in an anvil or block of wood, or into a metal die. Most buttons were dome-shaped and decorated with stamping, but where the proper dies were available, conical, fluted buttons also were popular. The smiths used these same button-making techniques to make the hollow beads used on squash blossom and other necklaces; each bead simply consisted of two hemispherical or conical buttons soldered together. Native aesthetics emerged most distinctly, perhaps, in the bracelets made in the last years of the 19th century. Bracelets, after all, were an indigenous form, and when expressed through the European technology of blacksmithing they became an art quite unlike any practiced by Spanish, Anglo or other Native Americans. 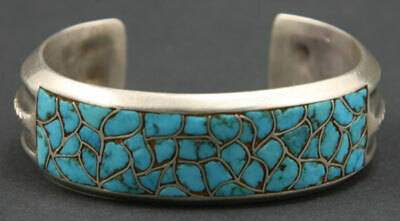 Southwestern silversmiths made four basic types of bracelets: the early bangles decorated with filing or stamping; two or more bangles soldered in parallel and decorated with stamping and stones; a flat band or cuff decorated with stamping, repoussé or stones; and “open work” cast bracelets left plain or set with stones. The Navajo and Pueblo smiths made these early jewelry forms primarily for themselves and their families, but also for trade to other community members and other tribes. They had a great love of ornament and the Navajo, in particular, used jewelry as a means of accumulating and displaying wealth. Although most Navajos wore some jewelry on a daily basis, they put their entire fortune on display during community events. Considering this dual function, Native-owned jewelry tended to be very heavy and showy, incorporating as much silver as was practical and as its owner could afford. By the turn of the last century, it became common practice for the Navajo to place some of their jewelry in pawn at the local trading post when it was not being used. Owners could borrow for food and supplies against the pawned jewelry, and they knew it would be secure in the trader’s safe until the next public occasion when they would redeem it and proudly wear it again. After the turn of the last century, the growth of tourism in the American Southwest brought enormous changes to the still young tradition of Indian jewelry making. Traders saw Native jewelry’s great potential as souvenirs because the designs were distinctive, turquoise already was associated with the Southwest, and jewelry was easy for the traveler to pack and carry. The jewelry made for Native use, however, was too heavy and expensive for the average souvenir seeker. At first, traders bought lighter, smaller items from their local smiths for wholesale to tourist shops along the rail routes. Enterprising Native silversmiths also sold their less expensive jewelry directly to tourists at their closest railway stations. By the 1920s, urban workshops had largely taken over the production of Indian tourist jewelry. These Anglo-owned business employed Native silversmiths to make inexpensive items on a production basis. The “bench smiths,” as they were called, often were very skilled and experienced, but the range of designs and techniques they used was greatly constrained by what could be made en masse and for the right price. To speed production and reduce costs, these shops often supplied their craftspeople with machine-rolled silver sheets, precut stones, pre-made appliqués and bezels, and sometimes even precut bracelet and ring bands. Because the items were assembled and decorated by Native smiths, they still could be sold as Indian-made jewelry. Many retailers around the southwest carried the thin, light, production jewelry but its biggest purveyor was the Fred Harvey Company which operated hotels, restaurants and souvenirs shops in conjunction with the Santa Fe Railway. To their credit, Fred Harvey also sold many high-quality examples of jewelry and other Native crafts to knowledgeable collectors and discerning tourists. The Company probably did more than any other business or institution during the first half of the 20th century to educate the public about Southwest Native arts. Nevertheless, it was the inexpensive jewelry that became the popular tourist icon, and now that whole genre of silver and turquoise is collectively known as “Fred Harvey type” jewelry. Individual silversmiths continued to make superior quality jewelry for Native use and for retail sale, but the market for Southwest silver and turquoise was decimated by the Great Depression and did not fully recover until the 1970s. As Native families became more integrated into Anglo culture and economy, they also had less reason to put a large portion of their wealth into jewelry. By the 1920s, many Native families had become dependent on the income from jewelry-making and so they persevered despite the economic downturn. In fact, the 1930s and 1940s saw several important innovations in the craft. As a natural outgrowth of their fine stone work, Zuni lapidaries developed a mosaic technique in the 1930s known as “stone-to-stone” inlay. Turquoise, along with jet, shell, bone, coral, ironwood and other materials of various colors were assembled into representational images such as kachinas, knifewing and rainbow gods, and animals. 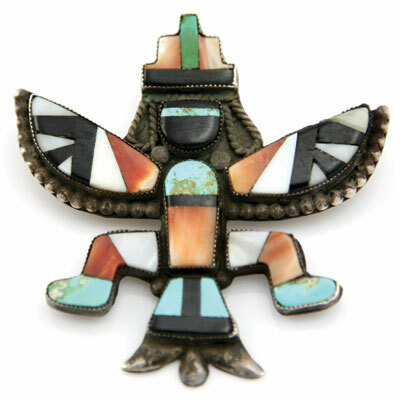 A related mosaic technique called “channel inlay” became popular in the 1940s among Zuni jewelers. In this method, the stones are separated by a thin strip of silver. Remarkably, the silver strips are not laid in when the stonework is done. Rather, the entire silver matrix is made first and then precisely cut stones are fitted into each of the spaces (channels) defined by the raised silver lines. Some Navajo silversmiths specialize in creating channel work blanks which are then sold to Zuni lapidaries. The channel technique is commonly used for both geometric and representational patterns. In the years following World War II, the Zuni developed a third type of stone work for which they are exclusively known. Now called “needlepoint” or “petit point,” extremely small stones are each placed in individual silver bezels which are arranged in linear, grid, or radiating patterns. Needlepoint jewelry is the virtuosic expression of the Zuni’s talent for fine stonework. Hopi jewelry making experienced a sudden transformation in the late 1930s with the introduction of a technique called “silver overlay.” A few Hopi smiths had made jewelry in the Navajo style, but (perhaps because of their proximity to the Navajo) silversmithing had not been a significant part of Hopi culture or economy. In 1938, Mary Colton of the Museum of Northern Arizona commissioned silver overlay designs from several Hopi smiths in an effort to revitalize silver craft and thereby provide both a means of income and a form of artistic expression that better reflected Hopi culture. Eventually, the Hopi achieved both goals. By the 1970s, the Hopi nation boasted proportionately more silversmiths than the Navajo. Collectively, they developed a simple metal working technique into a highly expressive craft. Silver overlay is made by cutting a pattern into a sheet of silver and then soldering it onto a second, plain sheet. When the underlying sheet is textured or darkened, the polished and patterned upper layer appears in sharp relief. In essence, the silver was a slate on which the Hopi smiths drew imagery unique to their heritage. In the beginning, they used abstracted forms and patterns borrowed from Hopi pottery, but they soon added stylized cut-outs of animals, plants, and people. Silver overlay remains a vital means of cultural expression for the Hopi people. Renewed national interest in Native American history and art in the 1970s brought new energy and prosperity to Southwestern jewelry making. Not only did the market expand to accommodate more makers, but the heightened interest in Native culture also fostered conditions that allowed the best smiths to elevate their craft into a truly indigenous art form. Such groundbreaking artists as Charles Loloma, Kenneth Begay, and Preston Monongye combined sophisticated aesthetics with unparalleled technical ability to create world-class designs that have reestablished the prominence of Native jewelry making in America. This article was excerpted from Canyon Road Arts: The Complete Visitors Guide to Arts, Dining and Santa Fe Lifestyle, volume 7, 2012-2013, pages 106-116. Canyon Road Arts is published by Medicine Man Gallery. All rights reserved.